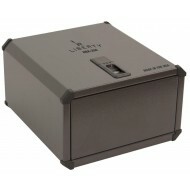 For peace of mind, store what is important to you in the Stack-On biometric safe. Not only does it have many high security features such as concealed hinges, it also comes prepared to be bolted down to your drawer or floor. With a sweep of your finger you have access to your Stack-On biometric safe. This instant access could be especially important to a gun owner. 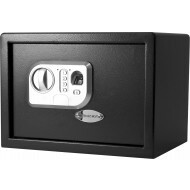 This safe has been approved by the State of California for secure storage of firearms. There is no faster way to access your firearm, than with a biometric pistol safe. With the touch of a finger your Stack-On biometric pistol safe will open. Easy to program, the biometric lock can be programmed to recognize one or thirty-two different fingerprints. If you choose not to use the biometric pad, there is an electronic key pad which can be programmed to your own code. Both the biometric and key pad lock operate with four AA batteries which will be long lasting because the locks pull very little charge. Fast access is further enhanced by the gas lift which pops the lid open when the case is unlocked by your fingerprint or code. 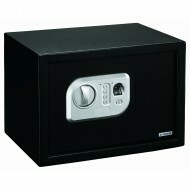 This small security safe from Stack-On is very versatile. It is wide enough to store a lap top and It is drilled so you can travel with it using a cable to secure it to a table leg or car seat. In addition it has the CA DOJ rating for the secure storage of fire arms. 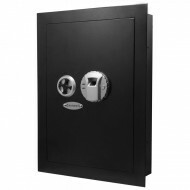 For a small safe, it has very high security features such as a solid steel pry resistant door, concealed hinges and two live locking bolts. The biometric lock ensures instant access. If more than one person will be using the safe, you can enter up to 32 different fingerprints, more than enough! 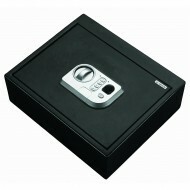 This Barska Biometric pistol safe gives access through either a biometric fingerprint scan or independent keypad access. Both systems work independently so as to not compound frustration and continuing to provide quick access to your handguns and pistols. Store up to 32 different fingerprints and 1 keypad access. Backup emergency key is provided. This safe can be mounted to secure its location. Please note the QAP1BE is OUT OF STOCK until July 1st, 2015. Get protection as unique as your fingerprint. The Quick Access Biometric Pistol Safe offers a suite of features for a powerful solution for home defense. Fast and reliable, the compression gas strut allows for single-handed, whisper-quiet access to your pistol. Choose between a biometric lock, zero-feedback digital keypad or an override key for quick, quiet access to your firearm. The safe is specially designed with a solid steel, pry-resistant door to ensure protection from unauthorized and accidental firearm access. A powerful solution for home security, the Quick Access Biometric Pistol Safe empowers you to protect your home and family when it matters most. 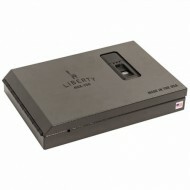 The MicroVault (MVB500 or sometimes GVMVB500) biometric pistol safe has a unique, notebook-style design which allows you to take your handgun or valuables with you. Its size and design makes it easy to bring with you. 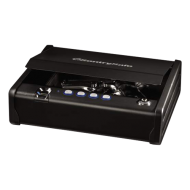 The biometric scanner provides almost instant access to your pistol safe. 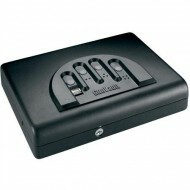 The Microvault Bio operates on a single 9 volt battery and has a LED warning light for low battery. The MVB500 (MicroVault Bio) uses fingerprint recognition to access the safe contents. You can add multiple fingerprints and change the fingerprint programming at any time. The MVB500 comes standard with a 4 foot security cable that allows you to tether it to a fixed object, making it perfect for home and travel. 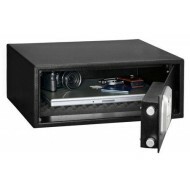 Barska AX12038 - 120 user capacity Biometric wall safe, two removable shelves & backup key. Use your unique fingerprint to quickly access valuables at a moments notice. Can easily be hidden behind pictures and furniture for added protection.